This week has been a week from hell. I have been stressed out to what I can only describe as sleepless nights. There has been a lot going on and for the first few days there was not much else I could do other than spend the day on the phone and most evening/ nights doing everything I usually do during the day. 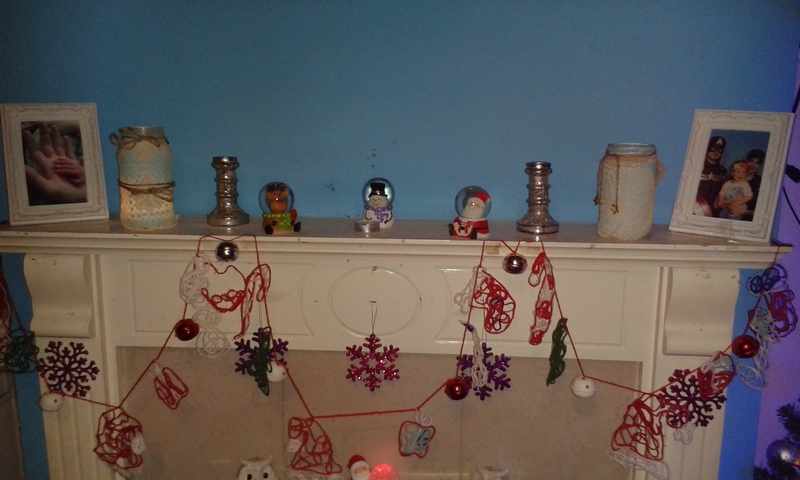 However the week did start on a very festive and happy note with it being time for some Christmas decorating! 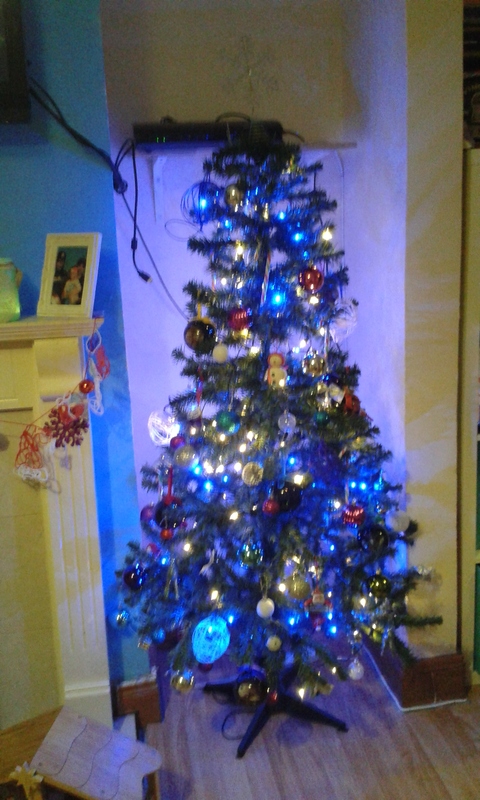 Myself and D started by putting up our Christmas tree. and starting to decorate it with the lights and ornaments. D was really excited to help this year and simply could not wait to get started. Literally! He dug straight into the ornaments box and I had yet to even open the tree! 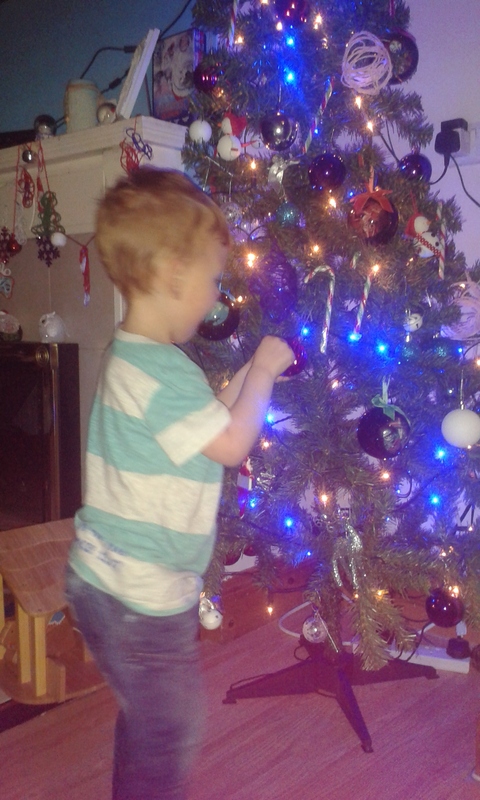 Once we got the tree up and the lights on D was more than happy to start with the decorating of the tree as you can see. After a while we got all the decorations on the tree and although there is still a good bit of space on the tree there is a reason for that. This year we are trying to include as many homemade decorations as we can so you can keep an eye out on our art's and crafts posts for some inspiration on your own homemade decorations! Next we set about putting up our hand-print wreaths (Click the link to make your own!) 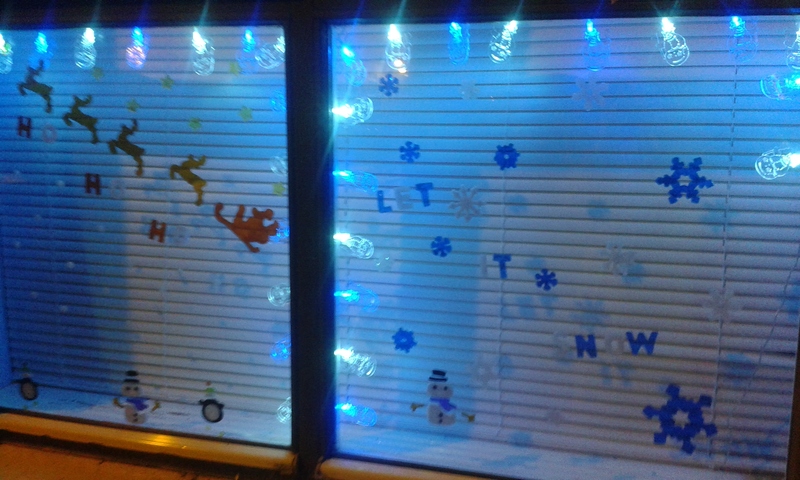 and our snowflakes (which we are sharing with you on Tuesday so do come back. That left only the fireplace, Table and the front window to decorate and we did really enjoy doing all three. 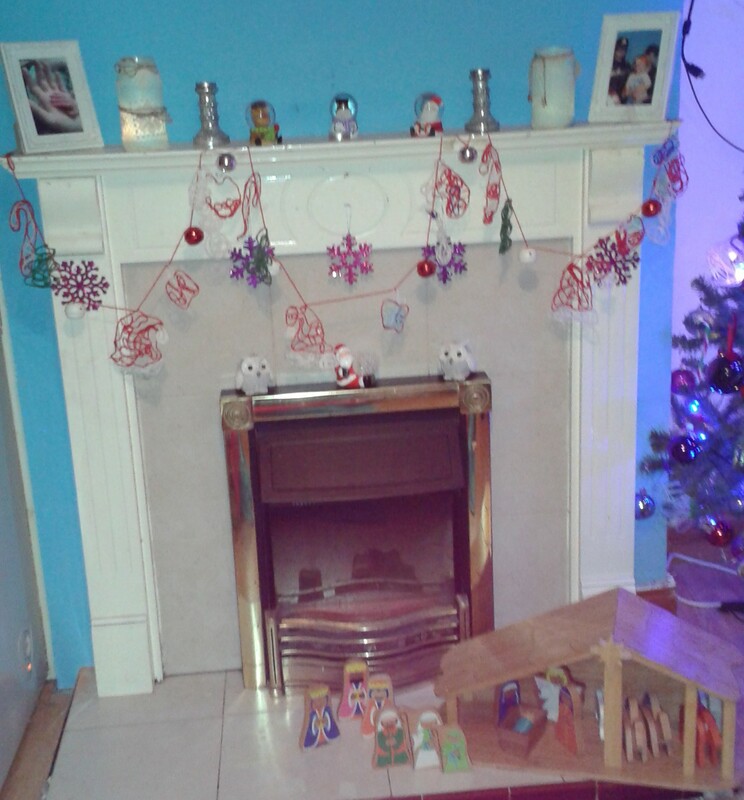 You can see our handmade garland with bells on the fireplace which we are also sharing on Tuesday! The Dining table. Can you tell I love those lanterns? Finally the window. 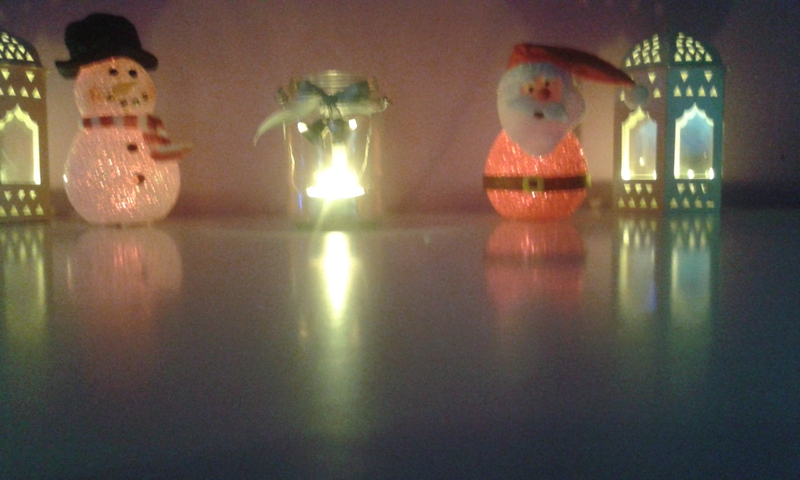 I love our snowmen lights! Monday, Tuesday and Wednesday were spent on the phone to various people or spent waiting on a phone call from said people. It was a very stressful couple of days and I really tried to spend as much time as possible during those few days playing games with D or taking a short walk when it wasn't raining incredibly hard outside. We did spend most evenings snuggled up on the sofa spending family time together. On Thursday we did go and visit Nanny where D had lots of fun soaking his uncle with a mist spraying fan. It took around an hour but he finally got there just before it was time to go home. Yesterday I spent most of the day tiding up and getting all of the materials we are going to need tomorrow sorted out as we are having a little craft day and might possibly get around to do some baking also.